Hot on the heels of Mark Bebbington’s ‘Private Passions’ comes another splendid CD that also contains works that have never been recorded before. 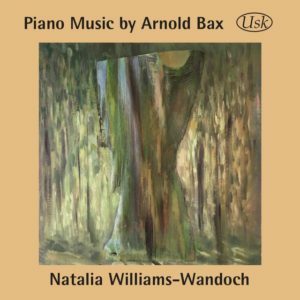 Natalia Williams-Wandoch has been playing the pieces included here at recitals over the past few years, and it was good news when we learned that she had decided to record them for the Usk label in January 2018. With a single exception—the slow movement of the Sonata in B flat—these are all world premières, and for that reason alone will be required listening for Bax enthusiasts. The Two Hungarian Dances are among his earliest surviving compositions, written when he was fourteen or fifteen as part of a collection of eleven ‘Clavierstücke’ (1897–8). The only other piece from this set to have been recorded is the John Field-like Nocturne in B flat, played by Michael McHale on RTÉ lyric fm CD139. Ra’s Dance starts out with bare repeated fifths, a ‘Magyar’ feature clearly deriving from Brahms’s works of the same name, though the pianist points out in her booklet notes a resemblance to ‘the folk-inspired theme of the Finale in Tchaikovsky’s Concerto No. 1’. Stylistically the two pieces are also reminiscent of Grieg: compare, for instance, the start of Ra’s Dance with his Springdans, Op. 38 No. 5, while On the Mountains begins in a similar way to the Trogsdans, Op. 54 No. 3, though the entry of the right hand also brings Brahms’s Hungarian Dance No. 18 to mind. These simple juvenile pieces indicate Bax’s teenage exploration of works by contemporary composers of the time. There is little in them that foreshadows his later music, but it is interesting to hear what he was writing a few years before he entered the Royal Academy of Music. Judging by the handwriting, the Sonata in D minor was probably written some time in 1900, when Bax was sixteen or seventeen. At a first glance, the manuscript, consisting of just a single movement, gives the impression of being an academic exercise, suggesting that it may have been written shortly after he started at the RAM in September that year. The 228 bars lack any slurs, have only one expression mark and include very few dynamics, indicating that the work was abandoned before he had polished it up. Compared with his later music, the textures are lean: there are many passages containing just single notes or bare octaves, and there are few dense chords. In order to make it playable, the pianist has very skilfully edited the piece, turning it into an attractive and ‘passionate work’ (to use her own phrase). Admirers of Bax’s piano music will again be intrigued to hear what he was writing at this time, soon after discovering Wagner but before he encountered the likes of Strauss and Debussy, not to mention his lifelong love-affair with the Celtic world. The four-movement Sonata in B flat (‘Salzburg’) is headed ‘Date: (conjectured) circa 1788’ followed by ‘Author unknown’, but it is actually a pastiche rather than a transcription of an anonymous 18th-century work. The story goes that in the early summer of 1937, at about the time Bax received his knighthood, the pianist and composer Alan Richardson met him on a bus and asked him what he was writing, to which he replied that he was working on a piece in 18th-century style. The opening movement is an Allegro moderato in standard sonata form with a repeat of the first subject group, a feature of which Bax did not always approve: he was pleased with Sir Henry Wood when he decided to omit them in symphonies of the period on the grounds that modern audiences were too familiar with them to put up with unnecessary repetition. The elegant slow movement was first recorded in 1991 by Eric Parkin, who used a photocopy of the manuscript and, not surprisingly, misread a few of the notes. It contains a sequence (bars 25-40) that Bax was to use in the slow movement of his Violin Concerto, which he probably began shortly afterwards. The third movement is a conventional minuet and trio, while the finale is a lively rondo that brings the sonata to a satisfying conclusion. The work has been referred to as ‘spoof Mozart’ and, even though Bax is known not to have been very fond of that composer’s works, he does seem to have captured much of the spirit and musical conventions of the late 18th century with great skill. It is a pleasure to be able to hear the score played complete at last, and the pianist performs it with just the right kind of touch for such a ‘period’ piece. All Baxophiles will be familiar with the orchestral tone-poems Nympholept and The Happy Forest, both of which have been recorded several times; but this is the very first recording of the original versions that were written for piano solo but never publicly performed as such during the composer’s lifetime. The title of the first piece derives from a Greek word for one who suffers from nympholepsy, a state of rapture inspired by nymphs and, compared with the other works on this disc, its textures are, on the whole, elaborate and complex. There are a few passages in the orchestral version that do not appear in this original, and there are other minor differences. It is puzzling why Bax never had the score published, and it is good to have it available on CD at last. The Happy Forest was completed on 13 May 1914 and is based on a prose-poem of the same name by the writer and drama critic Herbert Farjeon, whose original text is reproduced in Lewis Foreman’s Bax: A Composer and his Times (3rd edition, 2007, pp. 428–9). In 1922 Bax returned to the work and started making notes on it for a proposed orchestration, which was completed later that year or early in 1923. As the note-writer for the first performance observed: ‘The piece was first planned as a work for pianoforte, but never appeared in this form and was eventually evolved into an orchestral work. It takes the form of a Scherzo and Trio, and is so simple in construction that its composer deems any detailed analysis unnecessary.’ The final version does, of course, have the advantage of incorporating Bax’s colourful orchestration, but it is a pleasure at last to be able to hear his original thoughts after reading Farjeon’s poem. The performances on this disc are all excellent, the sound quality is very good, and the informative notes have been written by the pianist herself, though there is no mention anywhere in the booklet of the scores’ copyrights, which belong to the Sir Arnold Bax Trust, or that The Happy Forest, Nympholept and the Sonata in B flat are all available in print from Fand Music Press (www.fandmusic.com). For anyone coming new to Bax’s piano music, it should be pointed out that, unlike the two tone-pictures, the juvenilia and the pastiche sonata are not typical of his style; but the CD is highly recommended to those who are already familiar with any of the four numbered sonatas or the thirty or so miniatures published during his lifetime, all of which have been commercially recorded, with the sole exception of the Two Lyrical Pieces from Oliver Twist (1948). Nympholept; Sonata in B flat (‘Salzburg’); Two Hungarian Dances (Ra’s Dance, On the Mountains); Sonata in D minor; The Happy Forest.